Previous literature has focused on the need for support of undergraduate nursing students during clinical placements. Little is known about the support provided by employers for registered nurses (RNs) who pursue further education. 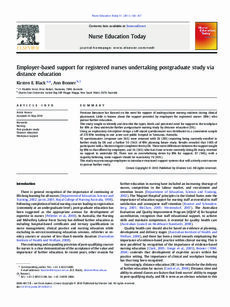 This study sought to identify and describe the types, levels and perceived need for support in the workplace for RNs as they undertake further postgraduate nursing study by distance education (DE). Using an exploratory descriptive design a self-report questionnaire was distributed to a convenient sample of 270 RNs working in one acute care public hospital in Tasmania, Australia. 92 questionnaires (response rate 34%) were returned with 26 (28%) reporting being currently enrolled in further study by DE and a further 50 (54)% of RNs planning future study. Results revealed that 100% of participants with a Masters degree completed this by DE. There were differences between the support sought by RNs to that offered by employers, and 16 (34%) who had done or were currently doing DE study, received no support to undertake DE. There was an overwhelming desire by RNs for support; 87 (94%), with a majority believing some support should be mandatory 76 (83%). This study may encourage employers to introduce structured support systems that will actively assist nurses to pursue further study.